Print, copy, scan, fax up to 11"x17". 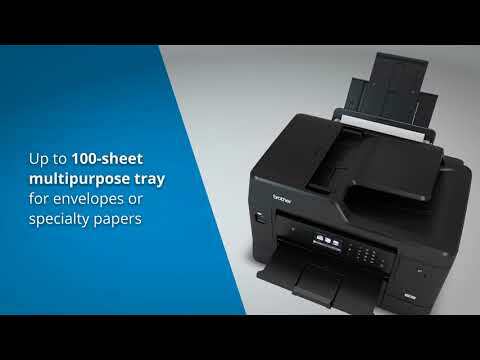 Small business and workgroup-focused features include flexible paper handling capabilities, automatic duplex printing, single-pass duplex copying and scanning, wireless and mobile device connectivity , and Super High-yield ink cartridges . Two-year limited warranty with free support for the life of the product. Print, Copy, Scan, Fax up to 11"x17". Ledger-size scan glass and up to 50-sheet ADF. Think two-sided: Single-pass duplex scan/copy and automatic two-sided printing. Super High-yield replacement ink cartridges offer additional page yields and help lower printing costs. Print and scan from almost anywhere - smartphone, tablet, laptop, and desktop computer. Added convenience of NFC "touch to connect" printing and scanning. Scan to popular cloud services directly from the machine, including Google Drive, Dropbox, Evernote, and more. Capture and digitize paper documents with Brother Cloud Apps for electronic storage or sharing. Two-year limited warranty and free support for the life of the product. Max. Input of ADF (Width/Height) 11.7"/17.0"